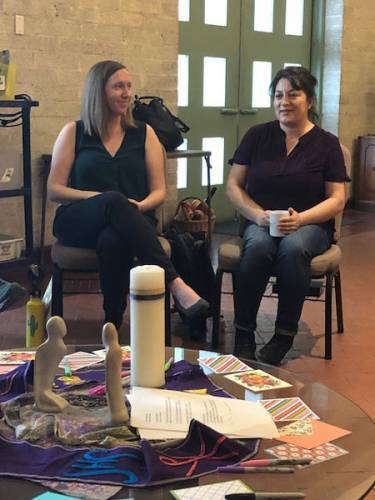 TUCSON, Ariz. – Rocio Calderon kept a Presbyterian Mission Agency delegation spellbound Monday just by telling her story. Calderon, who grew up in Bolivia, was locked away in a U.S. detention center for two years even after being economically exploited by an employer. One thing that kept her going, she said, was regular cards and visits by the Casa Mariposa Detention Visitation Program. Now not only is she a part-time cook, she works for the same program that helped her through her own incarceration. “Now I am around people who transmit a lot of trust,” she said, including people who support detainees from countries outside Latin America, including Russia, China and African nations. After her talk, her interpreter, the Rev. Elizabeth Toland Smith, provided cards for the visitors to write their own encouraging messages to people in detention. The effort made Calderon smile. Smith’s husband, the Rev. 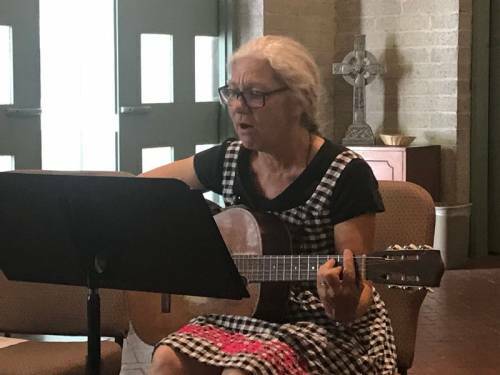 Bart Smith, pastor of St. Mark’s Presbyterian Church in Tucson, said members “are passionate about following Jesus for the common good.” Last year the church, which has about 200 members, decided to open its doors to people from Central America’s Northern Triangle who were fleeing violence and extreme poverty. One week each month, the church houses families – up to about 70 people at a time – seeking asylum in the U.S. They call the transitional housing the Hotel San Marcos. “Our strongest witness is being human in a dehumanizing situation, meeting Christ in other people,” he said. That evening the delegation, which is traveling the U.S. southern border and will conclude with time in Guatemala, was hosted by Northminster Presbyterian Church, a church that welcomes African immigrants and their service, in some cases, as ruling elders and deacons. “They are here because they would be dead if they weren’t here,” said Bonnie Thompson, a Northminster member. For worship the women from Africa dress to the nines, she said, sending for fabric from their former home so they can make beautiful clothing for their family to wear on Sundays. 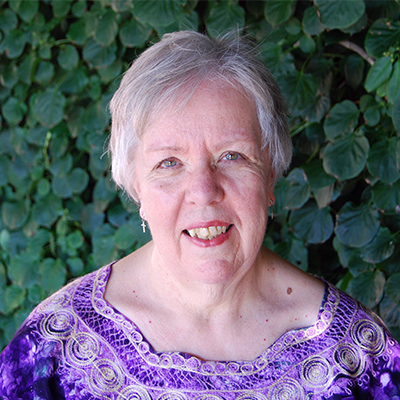 “They are a blessing to our church with their spirit,” she said. The Northminster church also hosts the Middle Eastern Presbyterian Fellowship, which holds services in Arabic. Its pastor, the Rev. George Bitar, said the congregation started “as people who came here as refugees.” One of his earliest tasks was visiting Tucson-area employers seeking jobs for some of his congregants.